Some people’s cats are anti social, closet hiding paranoids. If you visit their houses you will never see their cat. These people claim that their cats are soooo sweet and soooooo fun. “You should see them play with their feather toy!” they exclaim. But the truth is, I will never see them play with their feather toy because I will probably never see their cat unless I climb into the farthest reaches of their coat closet with a flashlight. Even then I will probably only see the green of the flashlight beam bouncing off their freaked out eyes. Their owners post their cats’ photos on instagram and facebook with captions like “Mr.Snuggle Muffin for president!” Insisting that the photo of the cat on the top shelf of the towel closet or hiding in a paper bag with terrified, overly dialated eyes is truly a lovable snuggle muffin. But Lemmy is different. Lemmy showed up one day, purring and sprawling out on my friend Andrea’s front steps begging for her attention. Weaving himself in between her legs, forcing his head into her hand to be pet. Perhaps he was the long lost cat of the previous tenant that had tragically and suddenly died in a motorcycle accident a few months earlier? Andrea fell in love with him immediately. She was so happy to take him in and have him live in his rightful home again. She gave him his new name of Lemmy. She ate lunch with Lemmy. 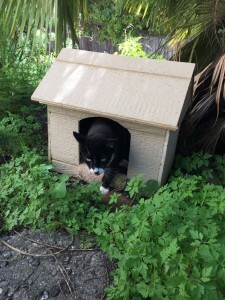 Her dad built a cat house for him. She kept a food bowl full of food for Lemmy. No one in the neighborhood knew who he belonged to so they all pitched in to give him a good life. Her next door neighbor said that before Lemmy found Andrea she had figured out he had worms and had taken him to the vet herself for de-worming. But one day the across the street neighbor’s son came over and told her, ” I think you have our cat, Shadow.” Andrea was devastated. ” Their cat? But they don’t even take care of him!” she told me. “Furthermore, what kind of a cruel name is shadow?” A noun, not a name. Just a description of his black coat. Then and there Andrea made a secret decision. Shadow will remain Lemmy and Lemmy will remain her cat–deep in her heart. She continued to feed him and have lunch with him and Lemmy continued to eat lunch with her and sleep in his house that Andrea’s dad built. A few weeks later Lemmy came to greet Andrea. He was still upbeat but he was slack jawed and foaming at the mouth. Based on the online vet advice sites, he had either been poisoned or in some sort of fight and his jaw dislocated. (This is actually a thing that happens to cats pretty easily.) But Andrea could see that one of his front nails was torn and bleeding so she figured it he had been in a fight. Distraught, she carried Lemmy over to knock on the neighbor’s door. “No that’s fine, I’ll take him.” Karen said. She picked him up and went into the house with him. Andrea didn’t see Lemmy again for three long days. Each day that went by her imagination spun worse and worse tales of what happened to him. Did they not want to pay for the medical care and put him to sleep? Was he slowly starving in the attic, not able to eat or drink?? On the third day, Andrea couldn’t stand it anymore and put a note on Karen’s door inquiring about him. She tried to get the tone of the note just right so that she wouldn’t sound accusatory or crazy. So that Karen would be comfortable with texting her news about him. “No Lemmy yet. So worried.” She texted me. Finally, a few hours after she put the note on their door, Karen texted to say that Lemmy was fine and at home recovering. He had had an abscessed tooth that had needed to be pulled. She thanked her for her thoughtfulness. A couple of days later Lemmy was back on the stairs eating lunch with Andrea. Let’s face it, cats like Lemmy, that live out doors in urban areas, don’t have that long of a life span. If the cars don’t get them then the dogs, cat fights that cause terrible infections, kitty aids or catching worms from the rotten food they scavenge will. So here’s the dilemma. Andrea is moving in a few months. Andrea loves Lemmy deeply. Lemmy seems to also love Andrea and loves spending time with her. The neighbors seem to view Lemmy only as a convenient mouse catcher and don’t seem overly concerned about his well being. Does Andrea quietly slip him into the moving van and start their life together in her new home? Does she give him a quiet life with vet care, a big food dish and a fluffy bed? Andrea will have to make her own choice on what’s right to do but I hope it involves Lemmy relaxing on a down quilted bed with a full belly, luxuriating in a sunbeam.